The Nezinscott is located on the southerly portion of picturesque Bailey Island, Maine. The property borders and overlooks Little Harbor, with ocean views to the east and to the west. A covered, wrap-around 'Farmers Porch' has chairs and end tables placed on it for those people desiring to sit and enjoy the beautiful easterly and westerly ocean views. Inside, the downstairs gas-fired (propane) fireplace insert adds warmth and ambiance to a large open living room area. One bedroom, a spacious kitchen/dining area, utility room, and a full bathroom are also downstairs. Note the downstairs bathroom has a toilet, sink, vanity, tub/shower combination, and also contains a full-size washer and dryer. Upstairs there are four additional bedrooms and one bathroom. The upstairs bathroom has a toilet, sink, shower, cabinet, and dresser. Access to Little Harbor, a semi-private beach, is provided for our clients staying at the Nezinscott. Note the water temperature in Little Harbor tends to be several degrees warmer than the open ocean in the summer. Please note: Comcast services at the cottage include television, wireless internet, and phone. Some features of Bailey Island include Mackeral Cove, Cedar Beach, the Giant Staircase, Lands End Gift Shop, three local restaurants, a general store and eatery , post office, and churches. Come and enjoy the beach, the island, and the breath-taking sunrises and sunsets of the Maine coast! ADDITIONAL RENTAL INFORMATION: Please contact for any possible off-season discounts and for any security deposit discounts on rentals that are 3 nights or less duration. CANCELLATION POLICY NOTE: Please note the Cancellation Policy has been set at 'Non-Refundable' after considering the choices offered by HomeAway. In reality, refunds for cancellations are made to the monetary extent that another reservation is obtained for the timeline that was cancelled. Debbie and George Johnson are year-round residents who work locally. George is a life-long resident of Bailey Island. Debbie worked as a teacher for 22 years, and for the last 7 years she has worked as a realtor. She works at Rob Williams Real Estate on Bailey Island for most of the year. During the winter months she works alongside her mother for Starlink Realty in Naples Florida. George has worked at Bath Iron Works for 37 years, primarily in structural design, he is also a licensed or certified home inspector in Maine & Florida. They have four children and two grandchildren. This home has been in the Johnson family since 1962! It has always been a rental & the Johnson family has welcomed hundreds of guests over the years. Some of our guests came as children and now they return with their grandchildren! Over 50 years of renting! 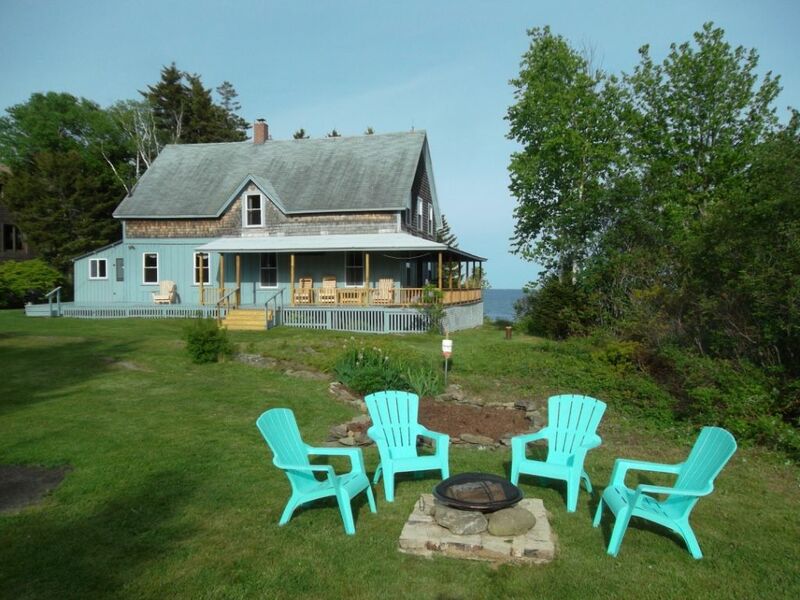 For people wanting to stay in a ocean-side rustic cottage, the location of the Nezinscott offers a combination of benefits: (1) Access to the beach area known as Little Harbor. (2) The property borders and overlooks Little Harbor. (3) There are sunrise to sunset ocean views from the east and west. (4) The only access to the Nezinscott Cottage is through turning off from a driveway that is private to the owners and their family. No one drives by the east, south, or west sides of the cottage. The location of the cottage is above and set back from the main road. In short, the Nezinscott Cottage is a rustic cottage located in a manner that offers beach access, ocean views, and a greater degree of both privacy and yard space than many other rental locations in this area. toilet, combination tub/shower, Clothes Washer/Dryer located in this bathroom. UPSTAIRS BATHROOM: Toilet, sink, shower enclosure, cabinet with mirror, small dresser with mirror, towel holders, outlets for hair dryer/accessories. DOWNSTAIRS BATHROOM: Toilet, sink, tub/shower combination, cabinet with mirror, towel holders, outlets for hair dryer/accessories. Full-size clothes washer and dryer is also located in the downstairs bathroom. The beach is readily available via a stairway. The Nezinscott is on a bluff overlooking Little Harbor. People renting the Nezinscott have access and privilege to use Little Harbor. There are both easterly and westerly views of the ocean. This property borders and overlooks Little Harbor. Walk down a stairway for access to Little Harbor. There is no deep water access for mooring a boat. Kayaks may be left in grass area near beach. Heat provided through use of gas-fired fireplace insert. New, high efficiency gas-fired (propane) fireplace insert installed 2017. Large living/dining room combination with ample seating. There are 2 refrigerators; one in the kitchen, and one in the utility room adjacent to the kitchen. Ample serving selection for 6-8. Crock pot, blender, flat electric fry pan, portable mixer. A few books on site in the cottage. Orr's Island Library often used by guests for books and DVD. The lawn is large enough for some outdoor activities. Kayaks/canoes are not provided. They can be stored in an area near the beach rather than carrying them back and forth from the cottage to the beach. Wrap around porch, with roof overhead (farmers porch). Eight (8) cedar chairs. Two (2) end tables. This is a rustic Maine cottage built in 1896. Significant infrastructure upgrades have been made to the cottage during the past several years. Note the heat source for the cottage is through a high efficiency gas-fired fireplace insert installed new in 2017. Upstairs there are four bedrooms, and a bathroom with shower enclosure. Downstairs there is a utility/storage room, an open kitchen/dining area, a living room, one bedroom, and one bathroom. The downstairs bathroom has a shower/tub enclosure, and full-size capacity clothes washer/dryer units. Weather permitting, the semi-private beach is sometimes used by guests as an access point for kayaking along the rugged coastline. Guests must bring their own kayaks and/or their own flotation devices such as rafts. This house was exactly what we were looking for. Historic, rustic, plenty of space and beautiful views. We loved it. LARGE, rustic farmhouse with lots of comfortable chairs and good lamps for reading. Tired of reading, do a jigsaw puzzle or just watch the sunset with a cocktail or sunrise with your morning coffee. Hard to leave it after two weeks. porch and small beach. 8 and 12 year old cousins from Brunswick visiting for the afternoon are begging us to rent next year and allowing them a sleepover. The Homeaway picture don't do it justice. Thank you for your kind remarks and we so enjoyed you as guests. We look forward to you staying another time with us here on Bailey Island. This cottage is large and spacious, and has a lot of modern amenities and comfort without sacrificing the historical and original rustic nature. Great views, walking distance to several fun places, and it's own beach in Little Harbor (very private). Nice owners close by. Rustic, open, plenty of room. Best spot for am coffee, on porch. Fantastic views!! Best lobster ever from Dave. This was our first visit to Maine. And I could not imagine a better place than Nezinscott cottage. We loved it! We are so happy you enjoyed your stay and we look forward to hosting you again. This was the best rental ever! This cottage was so perfect! We lived on the wrap around porch. There was always the best breeze from the ocean in back. We watched the tide come in and out, fog roll in and out, as well as lobster men hard at work. There was plenty of room for my husband and I and our 7yr old daughter. As well as our 22yr old son, his fiancé, and their 3yr old daughter. We never felt on top of each other. Everyone on the island, including the owners, were SO NICE! We met great people all happy to give great tips for hiking and sight seeing. Basically do and see everything anyone suggests and you will not be disappointed. Lastly, for never having been to in Maine, we felt like we got to see the best of it. We also were just 30min to 1hr tops away from Freeport, Portland, Biddeford, Booth Bay, and Cape Elizabeth. Awesome day excursions that ended back at our sleepy and good 10 degrees cooler cottage. The Nezinscott is approximately 500 yards from the south end of Bailey Island. Bailey Island is the last in a series of picturesque islands connected to the mainland by three bridges, the last of which is the 'Cribstone Bridge'. Bailey Island about a twenty minute drive from Cook's Corner in Brunswick. People considering staying on Bailey Island, but unfamiliar with the area may wish to note the following: There are grocery stores, laundromats, banks, shopping malls, a cinema, restaurants, retail outlets, fitness centers, medical services and facilities (2 hospitals), 2 golf courses, mini-golf, Bowdoin College, art museums, local historic museums, Bath Maritime Museum, and other attractions in the towns of Brunswick, Topsham, and Bath. Facilities in Brunswick, Topsham, and Bath are within a range of twenty to thirty minutes from the Nezinscott Cottage. Freeport (home of L.L.Bean, Inc.) is about a forty-five minute drive. Portland is about a one-hour drive away. In essence, the region offers an array of sights, activities, and resources for our guests, in addition to enjoying the unique natural beauty of rugged ocean shorelines. (1)Tentative reservations are not shown, please call or email for updated reservation information. (2) We do offer monthly rates for June and September upon request. (3) Prices are based on 6 person occupancy. The maximum occupancy is 8 persons, with prior agreement from owners for any occupancy over 6 persons. Note: There is a $25.00 per night per person charge, plus applicable state taxes, for a seventh and eighth occupant. (4) No pets policy. (5) No smoking. (6) Please inquire for possible off-season discounts. (7) For all offline bookings: A deposit and signed contract is required. The deposit is equal to one half of the total amount, including taxes, but excluding the security deposit. Remaining amounts are due May 1st, or at a minimum of 90 days before arrival, whichever comes first.. (8) REFUNDS FOR CANCELLATIONS: HomeAway dashboard options do not include our long-held policy, so it is stated here. REFUNDS FOR CANCELLATIONS will be given to the extent that another rental is obtained for the timeline that was cancelled, but never for more than the amount originally paid. (9) HomeAway alone collects and disperse all funds, including taxes, for all online bookings.